This Hasp will mount to the top of the fuel dispenser and folds over the front of the door preventing unauthorized door entry. Fits ALL Gilbarco pumps (Advantage, Encore 300/500/500s & 700 dispensers). Also fits ALL Dresser Wayne pumps offering big security upgrade from the standard door screws. Hasp is designed to accept PUCK padlocks such as the Cobra "Universal PUCK". Our Card Reader Security Box is designed to wrap around and secure the credit and debit card reader. 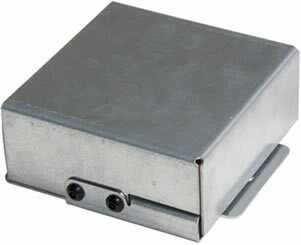 This security box prevents tampering with card readers and attaching skimmers. The card reader box is locked with the Cobra7 cam lock and supplied with two keys. Designed to work with major manufacturers gas pumps. The Pulser Security Cover is designed to prevent tampering with the pulser on the Gilbarco Encore 300. 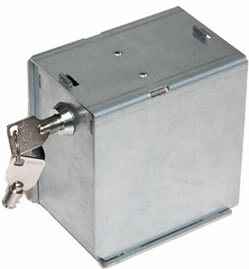 The Security box is secured with special anti-tampering screws. Constructed out of galvanized steel. We designed our GP1-Kit for the Gilbarco Encore 300/500 pumps. This kit will add T-Handles to replace the current utility locks, thereby increasing the security by 100%. Replace both utility locks with T-Handles that are then locked with any standard vending lock cylinder. The Cobra 7 Patented vending lock is highly recommended. 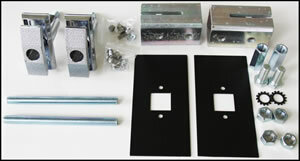 The kit comes with mounting plates, T-Handles and all mounting hardware.